As the telecommunications industry rapidly changes, VoiceOnyx remains concentrated on providing the very best service for Florida businesses, building on the last decade for the next. The telecommunications landscape has and continues to change in Florida, leaving some business owners in the dark about their options. As VoiceOnyx celebrates 10 years of serving Florida businesses, they reminisce about the past and look forward to the future. VoiceOnyx has been around long enough to see Central Florida's major cable provider change hands from Time Warner to Brighthouse, and as recently announced; to Charter Communications. “We pay close attention to the telecom industry here in Florida as it is important for us to help our customers better understand the most reliable Internet connection for their area,” says Edward Warren. Edward, the operations manager at the Orlando headquarters, reflected with the VoiceOnyx team as they highlighted the business practices that attributed to their last decade. VoiceOnyx closely monitors its customers Internet connections and provides a complimentary managed router solution to ensure consistent quality of service. “We have found that over the years, Internet service provider’s quality of service fluctuates as population density changes, or as technology evolves. It is our job to advise our customers on the most reliable connection for their business,” explains Edward. VoiceOnyx can provide a dedicated line based service, however, the more popular option has evolved to VoIP, which allows VoiceOnyx customers to change Internet service providers or to move to a new location without service interruption or the need to change their telephone company. “Florida went through a tough economic time a couple of years ago and we witnessed how hard some Florida business were affected and most were forced to downsize. We are now happy to report that almost all of our customers that survived the great recession are growing again,” says Elizabeth Allen, Director of Marketing at VoiceOnyx. While most telecommunications companies locked their customers down with long term contracts, VoiceOnyx has always remained contract free. “Making it easy for our customers to grow or downsize without penalty, hassle, or commitments, provides a peace of mind to business owners and some of our customers who have been with us for all 10 years are loyal to us for that reason,” says Christy Ghant, Director of Operations for the Jacksonville region. VoiceOnyx is enjoying growth as the Florida economy is now back in full swing and acquired Wonderlink Communications business customer portfolio last year. As the VoiceOnyx team celebrates their 10 years, they look forward to the next 10 years staying true to their tradition of always doing right by the customer. 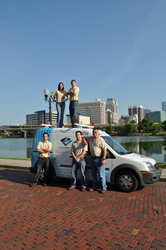 VoiceOnyx is a licensed and insured telecommunications company and provides services throughout the State of Florida. VoiceOnyx was established in 2006 and is headquartered in Orlando, FL.